In neighborhoods with a high rate of arrest and release, the influence of incarceration can spread beyond the individual and the family and spill over into the community (Western & McLanahan, 2000). High incarceration rates can destabilize communities by increasing the number of families headed by low-income single mothers, stripping the community of much-needed fiscal resources, upsetting kin networks, and reducing informal social control, particularly over young adolescent males. Collective efficacy—a community’s capacity to regulate socially acceptable behavior—is diminished by the disruption of incarceration (Sampson, Raudenbush, & Earls, 1997). The cycles of incarceration and release, combined with low collective efficacy, can result in even higher crime rates in the future, as subsequent generations are unable to prosper (Western, 2004). This fragmentation of community has been particularly harmful to African American communities who face disproportionately high rates of imprisonment exacerbated by racial inequities in drug laws (Clayton & Moore, 2003). 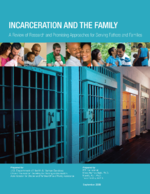 High incarceration rates can destabilize communities by increasing the number of families headed by low-income single mothers and reducing informal social control over adolescents.